One of my favorite blogs often does a 'year in photos', and I thought I would follow suit by picking one photo from every month of 2017. Although perusing photos from the year was enjoyable, it was a surprisingly difficult task. Obviously it was hard to pick the 'best' photo - should it be the highest quality photo, or the most meaningful? - but I was also surprised to see how my year had accordioned. Some months seemed to have disappeared, leaving behind relatively few pictures to choose from, whereas others have so many photos I could easily have included 5. Anyway, without further ado, here's my 2017 in one photo a month! January was Japanuary this year, and this was any easy pick. Audun broke his wrist punching a tree on our first day skiing, and after two rest days, resumed battle with the trees with one arm. If it slowed him down at all, I didn't notice. 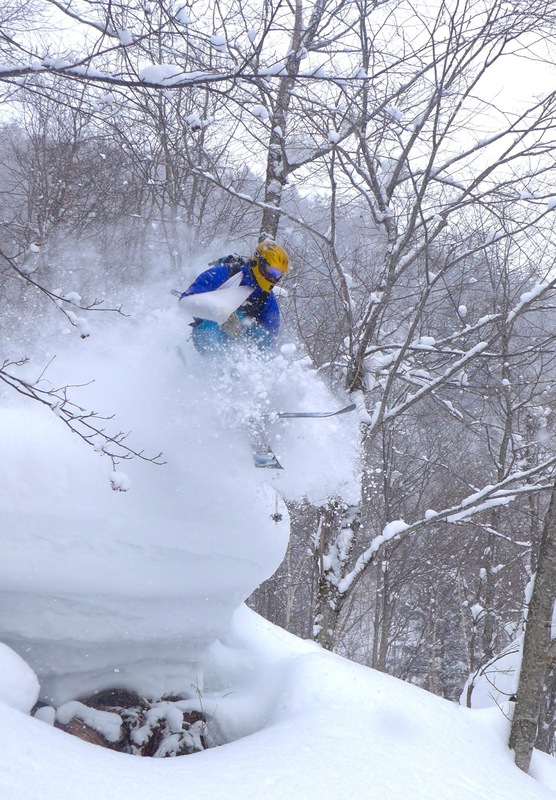 After traveling to Japan for skiing and then spending another two weeks in Asia for work, the remainder of February was a slow month. One memorable weekend was spent cross-country skiing at Skeipkampen (and relaxing watching world cup cross-country skiing) with our friends Vibeke and David. We got in one long ski tour in beautiful weather, which built my confidence to eventually sign up for the Birkebeiner. The picture is of Vibeke enjoying perfect ski tracks, sun and a gorgeous view. 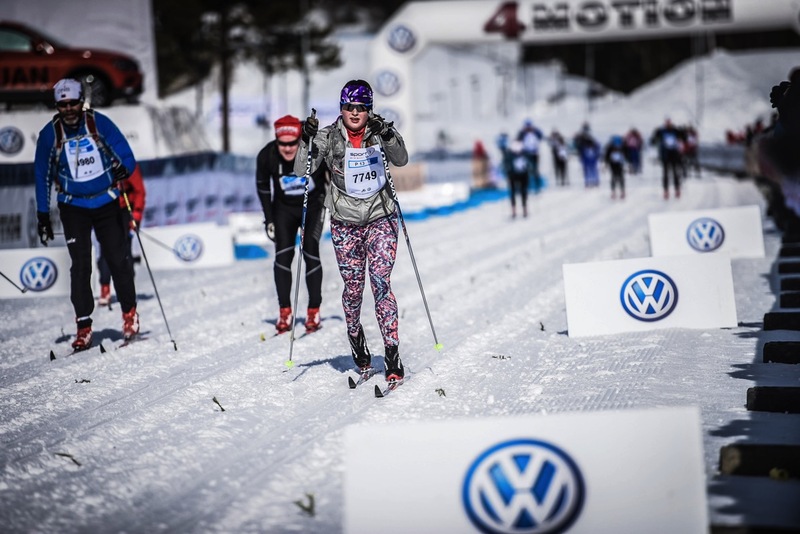 The Birkebeiner is kind of the holy grail of cross-country ski races, and it's been on my bucket list for a while. This year, noticing that the forecast for the weekend was stunning, I decided to sign up only two days before the event. This picture shows me in the final lap to the finish, overjoyed and tired after a beautiful day skiing over the mountain. Full race report here. 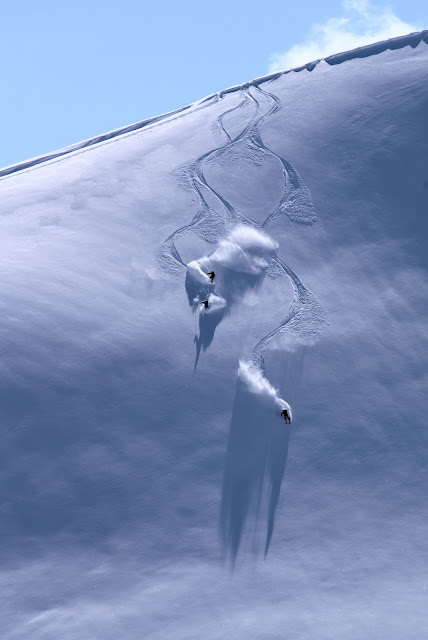 Hands down the most memorable ski day in 2017 was on Slogen. After skiing down the main face of the mountain, I saw Ken Roger splitting his split board to climb up an untouched knoll. Spurred on by the beauty of the day, I convinced Ingeborg to join me in climbing a little extra to get in a few turns. Fortuitously, Audun was in position to photograph us as we tore down the face. It was just as fun as it looks! In May, Audun and I travelled to Norddal on the west coast for a rollercoaster of events. Firstly, Audun's grandmother passed away on May 17, and we went to attend the funeral. She was a wonderful, strong woman with an incredibly positive outlook on life, and I am glad to have known her. Secondly, we were attended Audun's cousin's confirmation, a coming-of-age celebration that merits a full family reunion in Norwegian culture. 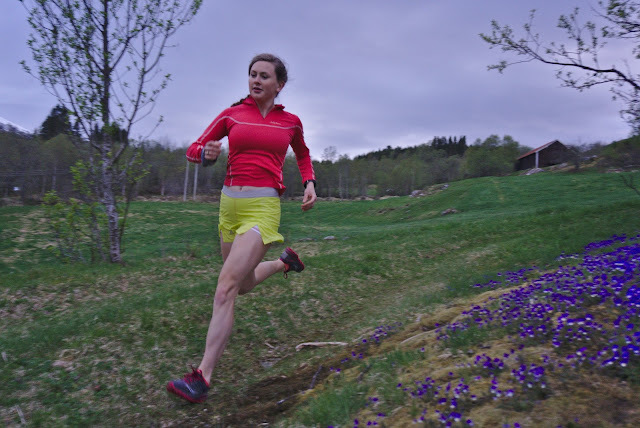 In between the whirlwind of happy and sad events, Audun and I got out for a run above the family farm. I look just as contemplative as I felt in this photo, running to digest all of the goings on and experiences. This was a quiet moment in all the rush. In June I travelled to China, Taiwan and Japan for work again, and spent the weekend in Taipei. I'm pretty comfortable getting around on my own in Taipei now, and so I planned a rather ambitious run in Yangmingshan National Park on the outskirts of the city. It was murderously hot, and the mountains were steep and bedecked with endless stone stairs. Here's a selfie I took on the way up Mt Datun, trying to capture just how steep it was. Completing Jotunheimen Rundt means more and more to me as time goes on. I struggled throughout the night, and seriously contemplated quitting. I simply didn't know if I would ever feel better. But there was a turning point, and I emerged from the depths of terrible night to a new and beautiful dawn. Completing such a long race showed me that I am stronger than my fatigue, and opens seemingly endless possibilities I hope to embrace in 2018. 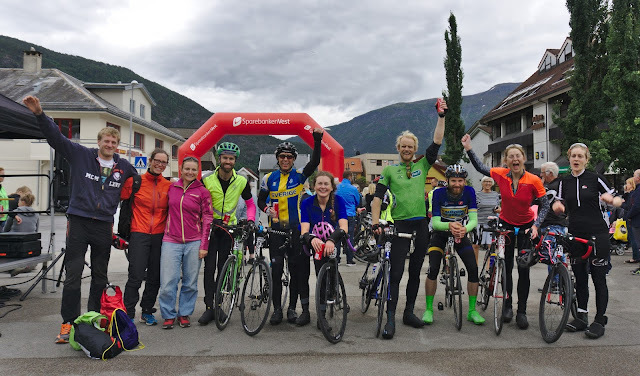 This photo shows our team, capturing the fatigue and the elation of spending 19 1/2 hours together on bicycles. We trained together, encouraged each other through the race, and somehow made it through to the finish. I would be remiss if I didn't mention my wedding! 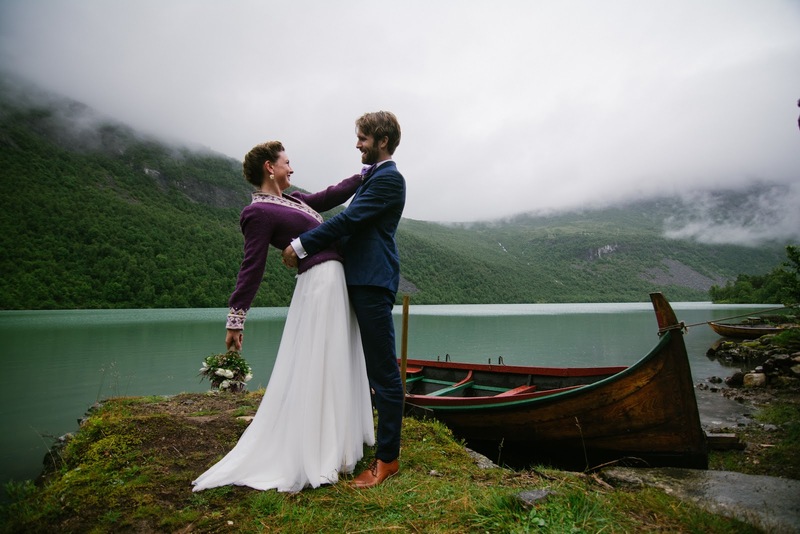 Audun and I tied the knot near his ancestral home in Norddal, on a grey, drizzling, cold August day. Despite challenging weather, we held an outdoor ceremony in a tent at Herdalssetra. I wouldn't have made it through the day without the beautiful wool sweater that my sister (and maid of honor) Zoe knitted to go with my wedding dress. 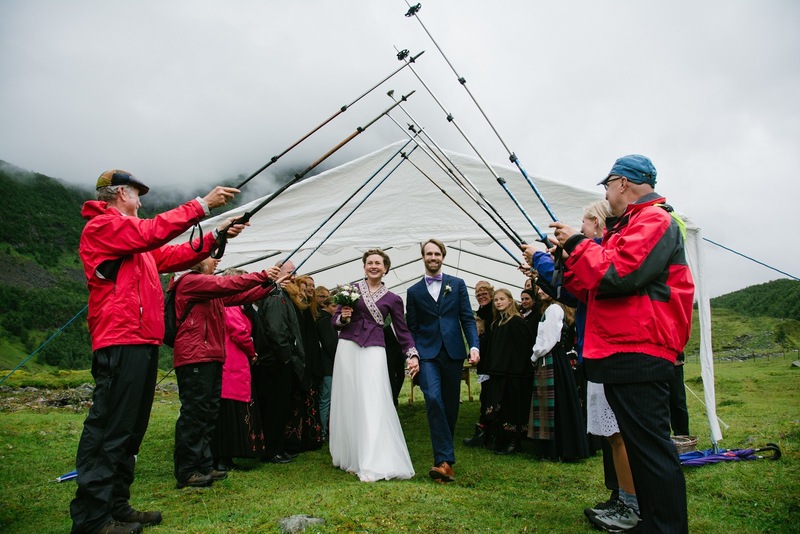 The first picture is at Herdal lake near Audun's family cabin, while the second shows a ski pole salute from our friends and family as we exit the tent as newly weds. In September I went on a spontaneous climbing trip that I had no business being on. 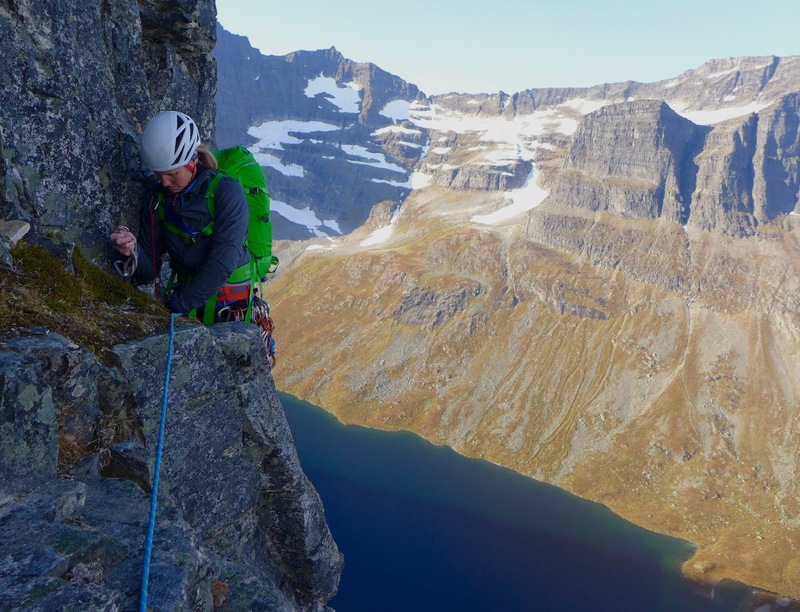 I took this picture of Hilde early on in our climb of the northwest ridge of Innerdalstårnet. I think I succeeded in capturing both the exposure and the beauty of being up on the wall. 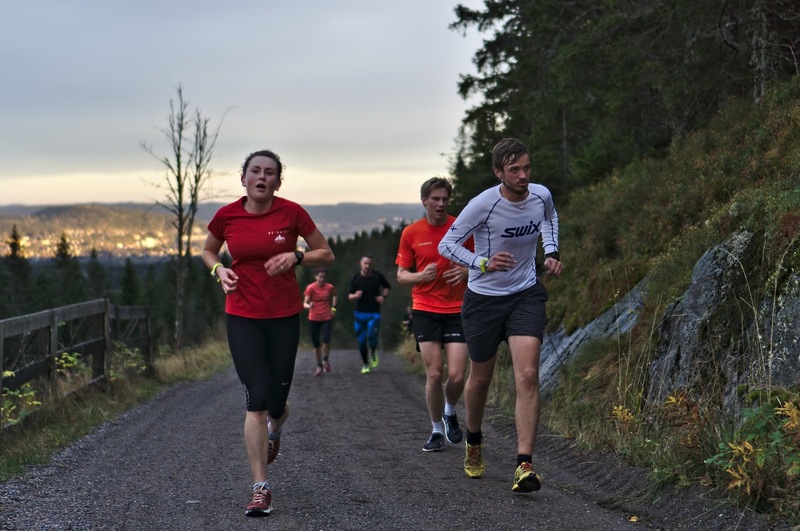 This picture is from the last race in an uphill series I ran throughout the summer. I'm in red (both t-shirt and face), gasping for breath with no energy to smile for the camera, still less than halfway through the 30 minute competition. November was kind of a dead month. I mostly recovered from several nasty colds, and cooked and baked a lot. I didn't find any pictures I really loved from November, so I put in an extra wedding picture (see August) instead. Audun and I spent an early December weekend in skiing in Blefjell. We battled strong winds for most of the weekend. 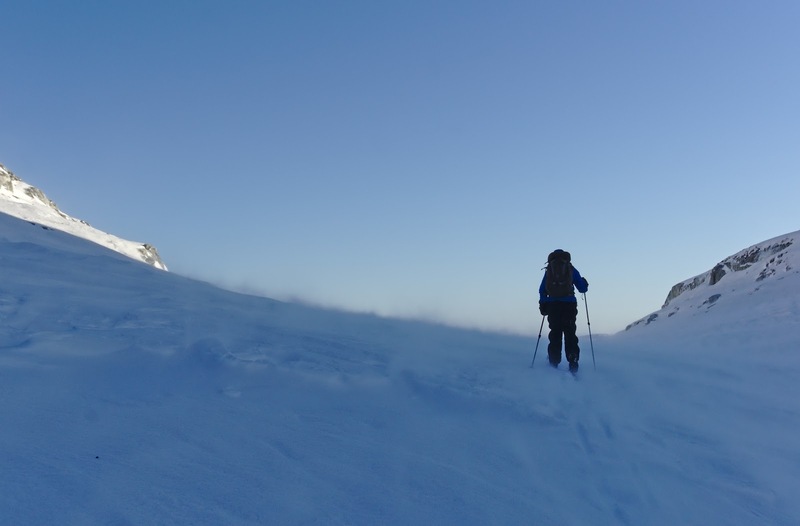 This photo captures swirls of snow animated by the wind at my feet, a beautiful illustration of the element we fought. Here's to a memorable 2018!